Beauty vinegar: sounds a bit strange right. Two words you wouldn’t usually place in the same sentence. Forget the malt stuff, this is a sophisticated cleansing / toning / smoothing hybrid. The concept sounds odd granted, but remember, people lost their minds when acids were first mentioned as an ingredient we should be using? you’d see perplexed faces and cries of ‘what, acid on my face, no thanks’. Now we see it everywhere, even my other half understands the AHA and BHA lingo. 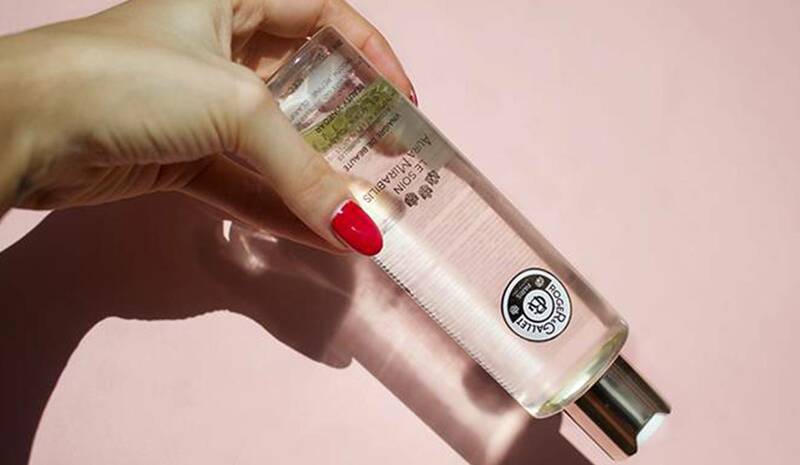 So firstly, what is beauty vinegar and what does it do? It’s a cleansing elixir that refines and purifies skin, inspired by the beauty preparations around the 18th century. These master distillers created facial cleansing vinegars made from flowers, fruits or spices which became popular for their cleansing ability and creating a clear complexion. Inspired by these vinegar-based formulas, Roger&Gallet Aura Mirabilis was born. Made with a nourishing blend of 18 botanical extracts – working in harmony to clear impurities, smooth the skins surface and leave the complexion with a healthy-looking glow. Basically think of this as your second cleanse (if you’re not wearing heavy makeup) / mild exfoliation. It’s not designed to be a cleanser per se, it’s also not recommended for the eye area so remove this separately with a cleaner. Once the initial cleanse is done, shake the beauty vinegar to mix the biphasic texture and apply to the skin using a cotton pad. As it’s a vinegar it’s more acidic which is beneficial for the skin, as it reduces the pH to a state the skin works best in. Aura Mirabilis Beauty Vinegar helps remove makeup residue and gently remove dead skin cells. This then allows this skin to best absorb the skincare you apply next. Why is there oil on the top? Its biphasic texture concentrates 18 officinal plants in the essence phase and fruit vinegar in the watery phase. Oil and water naturally separate so the oil sits above the vinegar liquid. The 2 phases are mixed once shaken, then returns back to its separated state. Does it smell like a chippy? Scent wise – it’s not as delicate as they suggest. It’s got a very distinct smell (a pleasant one may I add – addictive in fact) So much so that if they brought it out as a fragrance I’d buy it! It’s got a floral scent that’s freshened up with the sharpness of the fruit vinegar. I can’t quite put my finger on it, but it’s similar to a Diptique fragrance. Heavenly. Looking at the ingredients list below it is pretty packed. There’s a great deal of botanical and fruit oils in there, and as legally required they have listed the ones that are known to be potentially allergenic. Paeonia Alberiflora Root Extract – as the name suggests, this is extracted from peony root and has lightening properties. Think radiance, aka a brighter complexion – not skin whitening. Dimethicone – an ingredient that’s neutral for the skin and used in many cosmetic products, especially for sensitive skin. Overall I’m a fan, I have used it quite a few times. It hasn’t left any irritation and doesn’t leave skin feeling tight or tingly. It feels mild and cleansing. I use after my cleansers, then apply my serums and layer creams or oils etc. I have noticed my skin looks even and smoother after using this. I made a point of using it a few nights in a row and didn’t see any redness or dryness.